"The problem I had with the British tabloids to begin with was (them saying) 'You weren't so open with your private life. We don't want to know about the music - what about you?' If you be honest and say, 'I need time to myself,' they say, 'She sits in silence; she's weird.' What's weird about having time to yourself?" Because of this penchant for privacy, she says, in England she got tagged with the phrase "the Garbo of pop." "I want to be alone," Enya mimics, laughing. She admits, though, that the choice not to discuss her personal life will lead to suppositions. "Yeah, I know," she says, not willing to change course here and now. "I still think it was right, what I did, rather than worry about them, being concerned with being in the paper all the time." NEW YORK - She has sold more than 28 million albums worldwide, nearly 10 million of them in the United States. Her current album is at No. 2 on Billboard's "new age" chart after four weeks, and at No. 29 on the Top 200 that rates all albums. Her lush soprano has been heard in the films L.A. Story, The Age of Innocence, Green Card and Far and Away. She sings in Gaelic, mostly - sometimes in English, occasionally in Latin or Spanish. She has never toured as a solo artist. Her primary influences, she says, are classical and traditional Irish music. Do these descriptions seem incongruous? Doesn't this seem an unlikely mix for international success? Why has it worked? No, the 34-year-old pianist-songwriter doesn't know either, but she's got a theory about why she's popular enough to have sold more records than Eric Clapton (if fewer than Madonna) over a three-album stretch. It has to do with quiet space, the need people have for introspection and contemplation. "I've been thinking about it," Enya says, "and in today's society, a lot of people don't take a lot of time to themselves. They're actually afraid to. They're used to noise, TV, radio, traffic, the office. And a lot of people are so focused on problems all the time: 'What do I have to do next?' Problems, problems, problems, thinking ahead all the time." Her music, she suggests, helps people make constructive use of that time alone, provide an atmosphere in which thought flourishes. This, at least, is what fans tell her when they write. The music, she says, "is making them actually sit down and think about themselves. 'Am I happy?' 'What's happened in my life?' They interpret their own emotions to the music. It's personal to them. I remember one gentleman saying he felt anybody else in the room was like an intrusion on his privacy. It was so personal to him." Much New Age music can be dismissed as gooey twaddle, adult-oriented wallpaper stuff, elevator music that dare not speak its name. Say hello to Joh Tesh and Yanni, whose use of major chords and saccharine sentimentality attempts to jerk the heartstrings. Enya's music - her proper, solo debut album, Watermark, which featured "Orinoco Flow (Sail Away)"; Shepherd Moons, which has spent more than 200 weeks on the Billboard 200; and the current The Memory of Trees - does not come across that way. There's subtlety, quirkiness, a sense of adventure that's both stately and frisky. Repeated listenings reveal deeper nuances. Strings, synthesisers, spare piano lines and occasional percussion are intricately interwoven. The current single "Anywhere Is," has a crazy perkiness and bounce. And then there's that voice. Enya has a voice that, in its multi-tracked splendor, conjures up glorious, celestial images. She's a spiritual, vaguely sensuous dream-weaver, an angel at the gates of heaven. The implicit spirituality is no accident. "It's because I was brought up a Catholic," she says. "What I've done is I've kind of derived from religion what I'm comfortable with. . . . I love going to church on my own, the peace and quiet, I enjoy that and I think that crosses over into the music. And I've always loved church music, the hymns. Sometimes it's such a simple, but beautiful, melody, and I just love that when you know what the next note is, what you want it to be, you're aching for it to be that note - and it is that note! Thank you!" It likely came about, Enya suggests, because she hasn't any use for pop celebrity culture and has never gotten involved in heinous personal scandal. Also, she's well known for working in an insular fashion: She sequesters herself in the studio and works diligently, without input except from collaborators Nicky and Roma Ryan. For The Memory of Trees - the title, suggested by Roma, has to do with the Druid belief about what trees remember o our lives as we pass by - she toiled for up to 10 hours a day, for two years, writing and recording the songs. The duties of Team Enya break down this way: The artist writes the melodies and sings; Nicky produces; Roma, his wife, writes the lyrics. It's a tight, guarded circle - one that has stayed unbroken for 14 years. Of course, sometimes people want to know more about Enya. "I have a very private life," she says. "It's very important to the music, I think, that I'm able to have time away from the music and the lifestyle. The reason I'm able to have a private life is because the music is actually bigger than I am. For some artists, they're actually bigger than the music." No nightclubbing? No hanging with other famous people? "I was never drawn to that lifestyle," says the unmarried singer. "I always liked to go with what I wanted to do. I've been able to retain that. I feel lucky that I can do that. "I want to be alone," Enya mimics, laughing. She admits, though, that the choice not to discuss her personal life will lead to suppositions. "Yeah, I know," she says, not willing to change course here and now. "I still think it was right, what I did, rather than worry about them, being concerned with being in the paper all the time." 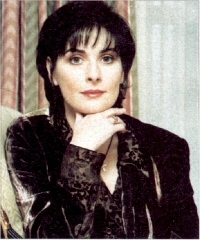 Born Eithne Ni Bhraonaim in County Donegal, Enya attended Catholic boarding school and studied classical piano. She also became immersed in Irish traditions and Druid mythology. Her career took shape without any grand design She joined her sister, Maire, and two brothers in Clannad, bringing keyboards into the mix. "I was two years with them," Enya says, of a period in the early 1980s. "I enjoyed the experience and the traveling, the touring, but musically I knew I was going to move on to something else." What that was, she didn't know. Clannad producer Nicky Ryan, however, had a suggestion. "He discussed with me his ideas about the multi-vocals," says Enya, "and I thought this was really, fascinating. I've always loved harmony. Other than just studying it classically, I'd been singing harmony since I was a young child, very spontaneous sort of harmony. He didn't know what he was looking for and I didn't know. We said: 'Let's try this.' "
The two first worked on a soundtrack to the BBC-TV series "The Celts" in 1985. She had no interest in lyrics - "I thought I was giving all I had emotionally and performance-wise to the music." But Roma Ryan was there during the recording process and had been writing poetry. "It was obvious that she was listening to the development of the music and the experimenting with the multi vocals, so she began at that stage to write lyrics. It's always been what I would like to sing about. It's not like she has to do that consciously, either What she derives from the melody is what I would like to sing. She gets that emotion within the melody." In 1988, Enya released Watermark, which broke her music worldwide, scooped up by New Age and world music fans. Shepherd Moons, in 1991, did ever better. But then four years went by between that album and the new one - an eternity in the fickle pop world. Was Enya nervous about whether her audience was still there? "I did wonder," she says. "Because (when) I go into the studio I forget about the success and I forget about the audience and I just work. When I finished, it was like my first album. I was quite anxious: Is there anybody going to listen to this? . . . There is no big guarantee for anyone, I don't care who they are. That's something I feel strongly about. So, I feel it's best to forget and just carry on and work on the music. At least, you'll be happy with your work." Indeed, Enya's sound - as co-shaped by Nicky Ryan, a Phil Spector/Beach Boys fan - is lush and layered. Enya plays all the instruments; she says she has sung up to 500 separate vocal parts on a song. She describes the compositional process as a journey. Though she reads and writes music, she considers herself an intuitive artist - "It's so striking emotionally, that wonderful moment you've been looking for." Most everyone who hears Enya is seduced by her sound. One critic, the New York Daily News' Jim Farber, wasn't and recently wrote her music was close to some "cheesy Hollywood depiction of the afterlife, glowing with counterfeit wonder." Farber's notion was that Enya was more marketing than music - contrived, not pure. "Well, I'm afraid he's wrong," says Enya. "Some people think I work very technically in the studio, doing all these voices, but there's no way you can be technical about it. The only thing that's to my advantage is that I'm a perfectionist and when I sing multi-vocals I will sing exactly in time, but free time . . . because there are certain times in the melody where there is a pause and I just love that pause. Because of the perfectionist side of me I'm able to keep in time, but still be very spontaneous and enjoy it." Enya has licensed her music for more than a dozen films, as well as for the TV series "Northern Exposure." "From the first melody I'd written, I thought it was very visual," she says. "It's something I enjoy and it's really great to have a well-known director or producer write you a letter personally." She has also let her music be used in television commercials for Crystal Light, among other products. (So did Clannad, most famously when "Harry's Game" was used by Volkswagen.) Does this have the effect of cheapening the music's meaning? "You have to weigh it," she says. "There is that risk factor, but if it doesn't work, we won't go with it. There's a lot of cases of that, but when it does work we do tend to go with it because if you don't, they'll end up doing a bad copy." Enya has hopes of taking this show on the road, though she's aware of what a difficult production it could be to mount. She envisions a choir - a lot of Enya-bes - and a small orchestra in a formal concert setting. "Hopefully," she says, "it's the next step we take. There are so many parts to each song. I think it's possible to get the textures voice-wise, because the texture of my voice varies so much, it's possible to get that combination. It'd be a lot of work, but the way myself and Nicky feel is if it's not going to work, there's no point in setting it up and saying, 'This will do.' It won't do. If it's not of a quality that we can be happy with, we won't do it." Note: Transcribed by Tom�s Rom�n. Two other articles by the same author appeared in the Seattle Post-Intelligencer (January 30th) and the Star Tribune (February 18th), but this is the complete article.